No, this is not a Gay Pride Flag. This is an Italian Peace Flag. 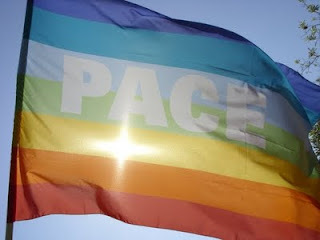 PACE is pronounced Pah-Chay and is Peace in Italian. It is an international symbol that I was unaware of. That is, I was unaware of until my former neighbour, a 90 year old Quaker woman who terrorized the Utility Boards in Philadelphia had one put up. I was driving home and nearly lost control of the car. Was she "Coming Out"? No, merely stating her Proud Quaker Heritage and wishing Peace to all. Ruth Miner, you were a fascinating woman and made my life in Chestnut Hill more interesting. Thank you!